It is a new, unused softcover book that measures 8.5" x 11". There are 48 full-color pages. Those luscious precut fabrics! You've picked them up, turned them over, received some as gifts, bought some - and now you're wondering what to make with them. Edie McGinnis has come up with some designs that will make you want to break open those packages and take them right to your sewing machine! Think gifts, think fun, think treats! 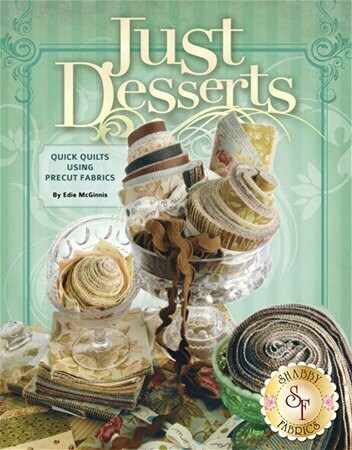 Grab your favorite Charm Pack, Jelly Roll or Layer Cake and whip up one of these quick desserts. You can try Petit Fours, Jelly Tarts and Muffin Baskets, among other delights that will suit even the pickiest palette. And best of all? No calories!